Fuller...shows how the colonists saw Antichrist personified in everyone from native Americans to the Church of England. He looks at the Second Great Awakening in the early nineteenth century, showing how such prominent Americans as Yale president Timothy Dwight saw the work of the Antichrist in phenomena ranging from the French Revolution to Masonry. In the twentieth century, Fuller finds a startling array of hate-mongers, such as the Ku Klux Klan, who drew on apocalyptic imagery in their attacks on Jews, Catholics, blacks, socialists, and others. Finally, he considers contemporary fundamentalist writers such as Hal Lindsey and a host of others who have found Antichrist in the sinister guise of the European Economic Community, feminism, and even supermarket barcodes and fibre optics. Shoebat and Richardson, meanwhile, claim that the Antichrist will be a Muslim leader, and fundamentalist "prophecy experts" are increasingly willing to agree. I wrote about Shoebat on Talk to Action last week, and I was afterwards contacted by Richardson on my blog. The subsequent correspondence demonstrates perfectly the intellectual dishonesty and opportunism at the heart of this latest fundamentalist Biblical interpretation. The subject under dispute is somewhat esoteric, but please bear with me. I went to the personal blog of the author of this article and saw that the image that he has posted of himself shows him sitting in a pub sipping a pint of beer. I fear that he may have been sipping a bit too much before writing this article. Next time, you may wish to step outside of the usual Wikipedia sourcing for your articles Richard. 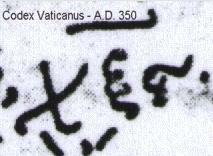 Codex Vaticanus, a fourth century manuscript of the Greek Bible...All NT Scripture after Heb 9:14 is missing. In modern times (fifteenth-sixteenth century) the missing folios were added to the codex, in order, as Tregelles conjectures, to prepare it for use in the Vatican Library. Presumably this is the origin of the "later supplementation" that Richardson thinks in some way makes Shoebat's case stronger; a supplement added 1,000 years later in Italy that in no way can be seen as part of the original Codex. But there's worse: the jpeg in fact shows a page from the 1868 Bibliorum Sacrorum Graecus Codex Vaticanus. This is a facsimile of the ancient text, but it has a typeset version of Revelation tacked on at the end. Shoebat perhaps used a nineteenth-century typeset edition of Revelation to draw the paleographic conclusion that a fourth-century Greek manuscript of the book (which doesn't exist anyway) meant to show Arabic letters! But Shoebat's whole argument was that by looking at an ancient manuscript he realised that Greek letters were not intended, whereas Greek letters certainly were intended in the "Byzantine Majority Text". And besides, it seems that Shoebat did not apparently look at any "ancient Greek Mss" anyway! It seems that the way to admit to being wrong in the circles in which Richardson moves is simply to declare the issue to be "irrelevant" and to change the whole terms of the argument. Hence Richardson points me to a new site he has made, in which he uses the letters from the 1868 edition (which, by the way, he elongates and misleadingly labels as part of the Codex) as the basis for his comparison with the Arabic. ...do I not see you publicly renouncing the doctrine of death for Apostasy that is practiced throughout the Islamic world and endorsed by Orthodox Muslims? As it happens, I have written plenty on Islamism and its unhappy consequences, but what that has to do with the issue at hand is unclear to me. Presumably the argument is that prioritizing truth and reason over hating Islam is morally deficient in some way, and that therefore my counter-arguments to the Arabic "666" can be discounted. Salem Kirban looks like a serious scholar in comparison. *Thanks to a reader for confirming the provenance of this - I had originally doubted the designation. Incidentally, a bit of irony: Fuller's book was published by the US branch of the Oxford University Press, which first hit paydirt after an academically bizarre but financially astute decision to published the apocalyptic Scofield Reference Bible in 1910! I thought the AntiChrist will be a gay German Jew. Had Senator Clinton won the Democratic nomination, the fundies would discovered the AntiChrist will be a 60+year old blonde woman. A theologian I respect believes that fundamentalists/dominionists/whatever (I consider them all part of the same problem) are as close to the "church of the antichrist" as any group could be. I tend to agree. They do seem to preach the inverse of Christ. The last sermon I heard in the Assemblies (when I physically walked out the door- 26 years ago) was a last-days diatribe. Not once have I heard of any good coming to "Christians" in their preaching- it's all death, doom, and destruction!!! I even asked one of those preachers -when I was a member of that cult- to preach a sermon about what Christians had to look forward to. He started (for about a minute) talking on it, but it quickly deteriorated into the usual "Here's what the sinners can expect- you must REPENT!!!" nonsense. I swear he (and the others) seem to relish the horrible things they talk about! I think it's a sign of serious emotional/mental issues and I pity anyone caught in their clutches. The funny thing is- they went at great lengths to "prove" their argument, just as the bozos you deal with do, and just as the "intelligent design" crowd does. The same sorts of distortions, lies, and false/bad logic also are common to all. I've heard the broadcasts of Calvary Chapel. They look forward to and revel in the destruction of unbelievers when warlord Jesus returns to take care of this scum. Btw, I also heard a Calvary Chapel pastor preach that 2/3 of the Jews will perish in the holocaust (his word). That's a revelation (no pun intended) about the Jews they claim to love so much. And remember, that if America becomes a "Christian" nation, nonChristrians wil be boarding cattle cars very soon afterward. If you haven't read Margaret Atwood's novel, The Handmaid's Tale, you should do so as soon as you can. She must have done a great deal of extremely distasteful research, as she describes the America which the dominionists would very much love to see, and actively work for. and added that experience to the America-watching (I gather that the fundies were thicker on the ground in the US than in Canada). Thanks for the tip about this novel. I checked it on Amazon.com. It's definitely on my reading list. Actually I don't want to state an argument regarding this post. But I would like to warn all people to avoid making the issues between religions. So it will not give a good result. Keep updating such post! Thanks for this post play free mahjong dimensions online if you are like to enjoy the games. there are more interested games are add this website.